24" x 8" three-rail pedal board with your choice of case. 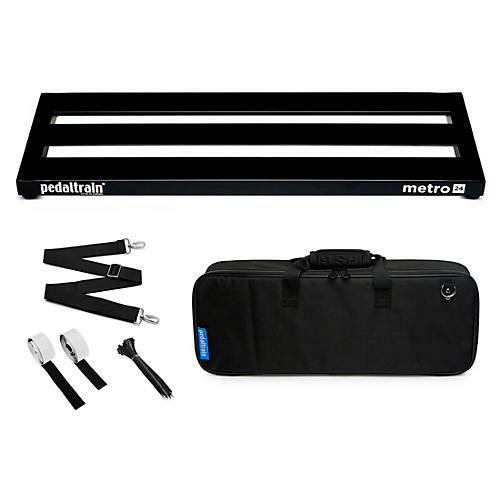 The Metro Series is Pedaltrain' first three-rail pedal board system and is perfect for players who need a portable, grab-and-go solution. Musicians who live or work in urban settings or tight spaces will appreciate Metro' featherweight aircraft-grade aluminum construction, low profile and horizontal orientation. Thanks to Pedaltrain' modified rail system, even the smallest pedals make an incredibly strong bond with the pedal board. Metro 24 is big enough for your essentials, including most multi-effects units. Included with purchase is 60 (153 cm) of Pedaltrain' professional-grade, hook-and-loop pedal fastener and plenty of zip ties for securing cables. Metro 24 also comes with your choice of a redesigned fitted soft case (featuring a heavy-duty metal zipper and reinforced stress points) or Pedaltrain' professional-grade tour case. Add this excellent pedal board to your setup with a quick click or call today!